In 1879, Thomas Edison invented the electric light bulb. For the first time in history, humans were no longer confined to the earth’s natural dark and light cycle. We became the masters of our domain, but it hasn’t been without consequences. The CDC reports, 35% of Americans are not getting the recommended sleep of seven hours per night. “As a nation we are not getting enough sleep,” said Wayne Giles, M.D., director of CDC’s Division of Population Health. I believe technology has played a massive role in our lack of sleep. 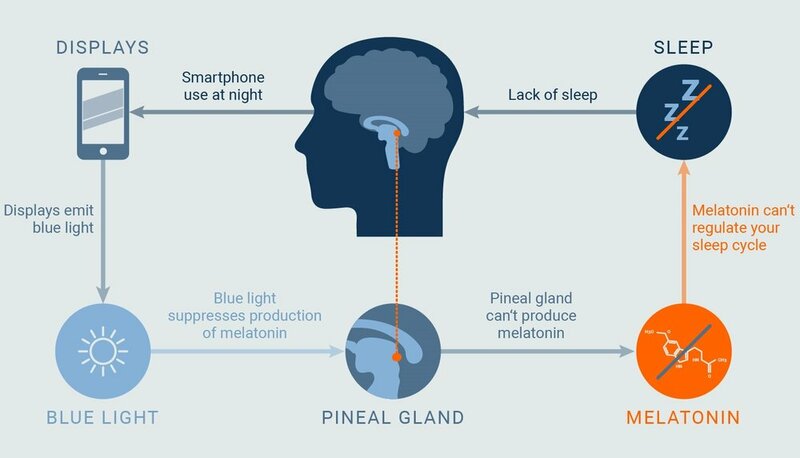 Night time light exposure disrupts our sleep cycle by inhibiting a powerful hormone called melatonin. In the New York Times bestseller, Why We Sleep, Matthew Walker writes, “Compared to reading a printed book, reading on an iPad suppressed melatonin release by over 50 percent at night. Indeed, iPad reading delayed the rise of melatonin by up to three hours…” But your phone and iPad aren’t the only things suppressing melatonin. According to Walker, a subtly lit living room can reduce melatonin by 50 percent. Melatonin is a circadian rhythm hormone that signals sleep and recovery in the body. It is created in the pineal gland when lower levels of light are detected. In addition to receiving light, the body's core temperature must drop 2-3 degrees Fahrenheit. Once both these needs are met, melatonin release begins around 9:00 pm and reaches its peak in the middle of the night. As you can see in the graph, melatonin and the stress hormone cortisol share an inverse relationship. Melatonin decreases the stress hormone. The reduction of cortisol signals to the body that it is time for bed. But melatonin is more than just a sleep hormone. Melatonin is one of the most powerful antioxidants in the human body. In fact, it is 200% more powerful than Vitamin E (1). This antioxidant effect leads to reduced inflammation by ridding the body of free radicals. Free radicals are toxic byproducts of breathing that cause damage to the body through a process called oxidative stress. A moderate amount of oxidative stress is needed, but an excessive amount can lead to an inflammatory response which can wreak havoc on your energy levels. In addition to the antioxidant effect, melatonin stimulates repairing enzymes which may increase energy, and longevity (2) Also, studies have shown that higher levels of melatonin promote higher levels of brown adipose tissue in the body (3) It is called brown fat due to higher mitochondrial density. Mitochondria are the cells responsible for energy production. So when the mitochondria improve, so will the metabolism. In addition to an improved metabolism, melatonin has been shown to boost an immune system, fight off certain cancers, and even help prevent type II diabetes, cardiovascular disease, and Alzheimer's(4). How Do I Increase Melatonin? I believe the excessive intake of blue night at night is one of the main reasons for poor sleep. To fight against this and improve your health, you must limit blue light to the daytime and reduce night time light exposure, especially between the hours of 8:00 pm to 11:00 pm. One of my favorite ways to do this is by wearing blue blocking glasses before bed. A study done on 20 volunteers were randomized to two groups, either amber tinted (blue blocking) or yellow tinted safety glasses. Both groups went through a baseline assessment to measure their sleep and mood for one week before beginning the study. The group who wore the blue blocking glasses three hours prior to sleep reported improved sleep quality and mood over a two week span (5). I understand this is just one study, and you can’t extrapolate too much from it. However, anecdotally speaking, I fall asleep much faster when I wear my blue blocking glasses. Also, my clients and friends have reported the same results. So based on the study and my own experiences, I am confident that blocking blue light at night can improve one’s sleep by increasing melatonin levels naturally. And just in case you aren’t a fan of the glasses, I have linked some other blue blocking products below. A quick search through the app store will allow you to find numerous blue blocking applications for laptops and phones. For the home and bedroom, I recommend installing Philips Hue Lighting . The light bulbs allow you to control the color and brightness of the bulbs from the comfort of your phone. I have been using them for two years and have found great results. Remember, melatonin is a powerful hormone, it improves metabolism, reduces cortisol, inflammation, and strengthens the immune system. But the only way to reap these benefits is by reducing evening blue light and getting adequate sleep.